How many bugs do you think you’ve killed in your life, whether by accident or on purpose? Becky Simpson is an Austin-based designer, illustrator, and writer, and she is blowing up right now. She just had another book, The Roommate Book, come out to rave reviews, and her design and illustrations are being sought after by many. In 2015-2016, Mrs. Simpson was one of the first two Adobe Creative Residents. During this time she founded Chipper Things, a lifestyle product line and online store stocked full of her playful illustrations. She wrote and illustrated a book called I’d Rather Be Short when she was still at her first job. It’s 100 reasons why it’s awesome to be of small stature, and it jump started her freelance career in a big way. She has since worked with vast and varied clients such as Kianga Project, Baylor University, Spearhead Properties, GCG Marketing, and many more. Becky is a prime example of how one can turn art and design into business. She is inspired by people, experiences and what she liked drawing as a kid. She also has a lovely smile. It was so much fun to ask her very dumb questions. Q. One thing the perfect roommate could do to turn you against them? Spend all the rent money on a souped-up Vespa. Q. SXSW or Austin City Limits? South by Southwest. It is always more of a mystery. On every corner there is so much going on. There’s parties everywhere, anything can happen. It’s really fun and the whole city is alive, which people in Austin tend to hate at the same time because it’s so packed. There’s a music week or the interactive week. Of course, you can do both, but I do the interactive. I had a badge this year, and it’s like there are no ends. There is no limit to how much you can explore. Everyone is there like Michelle Obama, Ira Glass, the Broad City girls, and the bands and things. Q. If you could collaborate with any dead writer, who would it be and why? The first one that came to mind was JD Salinger, but I think he would probably hate collaborating. I think I just want to have my name on his book. Even though it’s like totally not at all what I write. Just sit and write and chat with him. He would tell me to be quiet. This is not us, this is me, he’d say. I’m like this is us, us. And then he’s like just stop it. Q. When’s the last time you said NO? I think it was yesterday that I said no to something that was substantial. I mean that’s a relative term. A college student wanted to possibly intern for me, and I kind of do want an intern, but I don’t think I’m ready for that right now. It’s not good timing. I’m like it’s not you it’s me and that was my no, because I’m kind of in transitional time with my business, with freelancing, and Chipper Things. So I’m kind of just trying to get the system set up at this time, before I get ahead of myself. Q. Do you own any domain names you don’t use? Yes definitely. My little brother used to work at GoDaddy and he taught me about domains for things. A few Christmases ago I researched some stuff. I probably don’t own these though. I probably let them expire, but it was like Iowa health practices that I thought would pay me the bucks, they didn’t. Yeah, I still have like a handful of domains just hanging out. Q. What is your current go-to karaoke song? Well, what I do is I honestly take control of my list when I go. I do like Ms. Jackson (by Outkast) a lot because I think rap is hard to pull off in karaoke, but I learned all the lyrics to Ms. Jackson in 8th grade. And ever since then every time I sing along with it at a party or a bar, I feel just as cool as I did when I was 14. So if I’m in a private karaoke room and it comes on, I’m like oh who did that and it’s really fun. Also, I would really like to do “Are You That Somebody” (by Aaliyah) right now. Like if my office turned into a new karaoke room I would probably do Aaliyah first. Q. You have very nice teeth, have you ever had braces? Oh my gosh. Thank you first of all. Okay, so I had braces late in high school, senior year, and I had them for only like 6 months. When I first got them or was going to get them, it was because I had kind of fang teeth, and I had like this really dumb smile so I tried to hide it. My dad was like maybe you should just wait, maybe you should just finish high school, and you can start college with them. I was like no dad, that’s a horrible idea. I had them for like 6 months and I told my orthodontist, I was like these have to be off before homecoming. So that’s where my priorities were when I was a senior in high school. I wear my retainer every now and then, so I appreciate you saying that because people don’t know my plight with these teeth. Q. Chocolate chips or potato chips? Definitely potato chips. I like chocolate but it’s usually too sweet. I don’t love brownies and stuff like that. I’ll be salty. Q. Belt or no belt? I think that might be my favorite question. It’s so simple. I’ve recently gotten back into the belt for a specific pair of shorts, for utilitarian purposes. But I’m not in the business of belts for fashion as a way. Q. What were your drawings like as a kid (share one)? I liked to draw people. There’s this one portrait that I have of myself from second grade, and it’s like I was really trying really hard. I think there might have been shading. It’s very delicately done. Then my brother Ryan, he’s a couple years older than me, drew these snot lines coming from my nose on this self-portrait. You know kids sometimes they write really hard, and he wrote it so hard that even after I erased it, it’s still there. That’s one of my favorite pictures, my brother ruining my art, and how mad I was. It was a lot of doodles. Do you know the book Amelia’s Notebook? It was this sort of doodled diary by someone who was maybe 10. I was at that age and I loved it, so I did my own. From an early age I like to sort of do this writing, doodling, like personifying people, with arrows explaining, like, this is what Lindsay really actually looks like. When she was mean, and I was mad at her. It was a lot of inspiration from my environment. Q. Do you save birthday cards? I just love these questions so much. I started to throw them away more now, but if there’s like a very special note I’ll keep it. So I do save some. Q. 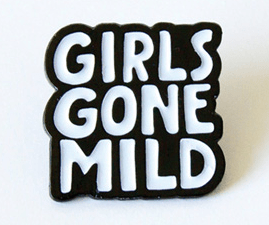 Define girls gone mild? Okay, oh wow, wow, wow. Let’s see, I’m trying to think of a really clever spunky answer here. For me, a girl gone mild is like, it’s 4:30pm and I’m going to drink some wine because I have wine in my house. It’s not wild. Like a girl who is pretty straight-laced, sometimes needs to get a little crazy, but is still like pretty PG. Yeah, I am going to eat pie for breakfast. Q. Do you still have to pay for Adobe products? Not the software. I feel very, very grateful for that. They have been really great. I think the world of that company. Once you are in it, they all sincerely care about your success along the way. The energy they gave me and continue to give me, it still feels like I’m part of the family. They treat people really well.